Igbonla: Kidnappers demand N400m ransom – Royal Times of Nigeria. 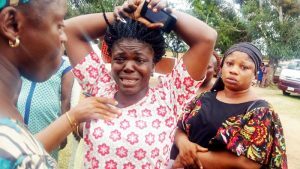 K idnappers of six pupils of Lagos State Model College, Igbonla in Epe have demanded a N400 million ransom for their release. They are understood to have got in touch with the parents of the kidnapped children to make the demand. But Governor Akinwunmi Ambode told pupils at a parade to mark this year’s Children’s Day at the Agege Stadium, Lagos that government would do all within its power to get the children out of the kidnappers’ den unhurt. The six students were abducted on Thursday morning when gunmen stormed the school and ferried them away through the waterways. The kidnappers were said to have established contacts with the parents at about 4:30pm on Friday. The parents said the kidnappers did not allow them to speak with the children. They only told the parents what they wanted and how to go about raising the money: ask the school authorities and government to provide the money.